There is such high anticipation about this movie, and hovering at 8.6 on IMDB, I can see why. Saw it tonight with a Director Q&A, and it's really exquisite. It's imperfect, of course, as all things are, but it has a tremendous opening sequence and finishes strong. Around two-thirds of the way in, it sort of tires (no pun intended), but it eventually finds its groove, gets back on track (a-hem), and redeems itself. If you've ever read one of my reviews, you know how much I hate "boring" films, and also films with no music. Music is often overlooked, and I think great music can make a poor film digestible, like lousy meat with great sauce. Here, we have a film that is anything but boring, and its music is ceaseless. There were times I thought, "Oh, this is a bit too much now," but it was still fun as heck. Many of the tunes remain in my head, some 2 hours later. Lots of zingy/zany/zippy characters, beautiful vinyl record collections, quirky mix tapes (think Guardians of the Galaxy), colorful set decoration and, of course, chase scenes as good as any I've ever seen. And in a Subaru, no less. It's like my dad says, "A good golfer could play with a rake." Here, Baby (Ansel Elgort) can do things in a Subaru, a Nissan, a Honda...that you've likely not seen before. 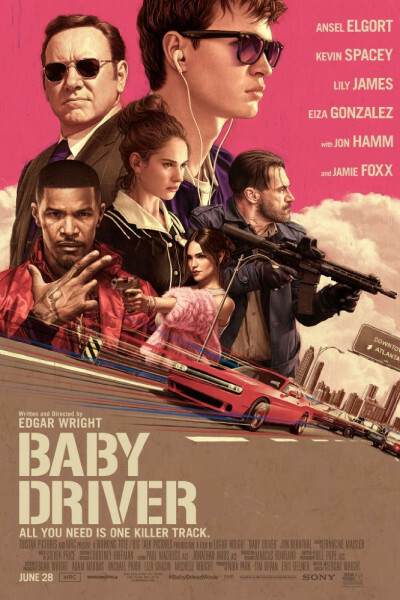 Remember, 2011's Drive with Ryan Gosling is way better (moodier, more atmospheric, deeper), but Baby Driver is worth the...a-hem again...ride. It's like cotton candy with bebop, so it's an entirely different tone: fun, fast-paced, rip-snortin' and 1950s. Clocking in at nearly 2 hours, you'll have ample time to amp-up, chill, then amp-up again for a flourishy ending. If you're looking for a feel-good July movie, this one aims to deliver.